Davis has much to offer to prospective businesses. With the world-class research facility at UC Davis, the city has access to top researchers and students. Davis is home to an active population, superior schools, a vibrant downtown and a prime location — just a few of the many reasons businesses find Davis so desirable. Davis’ workforce consists of highly-skilled and technical people involved in a broad spectrum of employment. Primary representation is in professional, technical, and governmental occupations. This distribution is due mainly to the city’s close relationship with the UC Davis campus and the professional and technical environment the university creates. 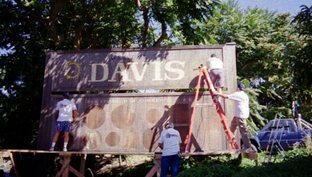 The Davis City Council is committed to promoting economic development in Davis. Specific goals are to provide retail opportunities that meet the needs of Davis citizens, promote high-tech and biotech development, create diverse job opportunities, and assist in the fiscal stability of the city. Davis benefits from substantial investment in research and office space from local companies such as AgraQuest, Schilling Robotics, Z-World and West Yost & Associates. To find out more, visit the Davis Chamber of Commerce website at www.davischamber.com and the City of Davis Economic Development website at www.city.davis.ca.us/ed/.